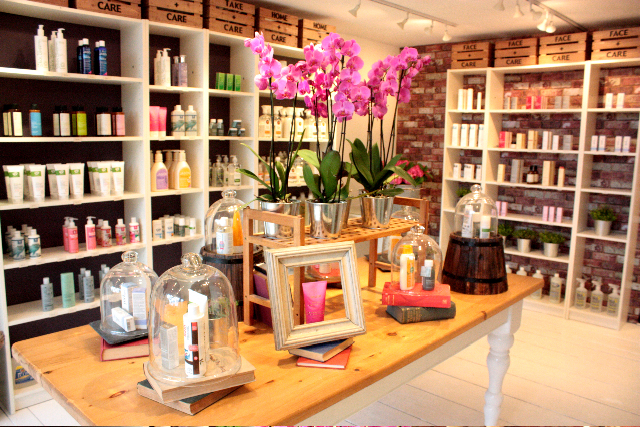 Berry Diaries: Skin+Care - The Stunning new Shop in the Wimbledon Village. Last weekend as I wandered about the shops in the Wimbledon Village, before I met Robs for lunch, I discovered the most fabulous shop. 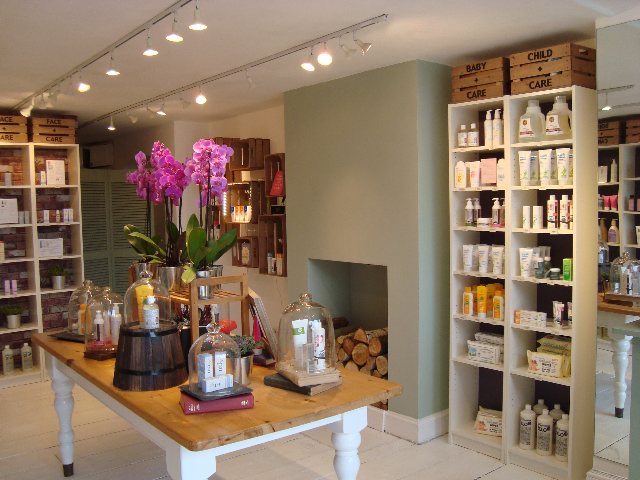 A shop devoted to natural skin care and household products, owned by a fellow South African, and so so pretty! Within moments of meeting Lisa, I was captivated by her passion for good quality, no nasties skin care, and fascinated by her knowledge of the beauty industry. She is also so incredibly friendly, that within minutes I felt like I had known her forever, I have since noticed this happen with each person who comes through her shop doors! I bought the Green People face wash that she recommended for my particular skin needs, and I can not believe how great my skin is looking! And I know that it is better for me, than the one I was using previously:) I popped in to see her again this weekend and Lisa agreed to answer a few questions for me to share here. Your shop is gorgeous! When did you open? Were you working in the health and beauty previously? No, in fact I am a qualified Solicitor in South Africa and the UK and recently left my job in a Investment Bank in London to pursue a cause I believe in and am passionate about. I have used Natural and Organic beauty products for the last 4 years and was getting frustrated that such effective products were difficult to source, I found it difficult to find salespeople who new what they were talking about and people who gave a good honest perspective. I wanted to bring these amazing brands into the mainstream and prove you can wear natural and still be a 30 something:) business woman - you don't have to be wearing tye-dye and chanting to think that natural products work. Going natural was a decision I made after doing research into the ingredients in my everyday products. I was quite shocked to find out the origins of most of the ingredients and what they meant and what they did. Alarmingly the worldwide cosmetic industry is not regulated. I realised how naive and ignorant I was just trusting shops, advertising and government organisations setting standards. So the shop is a platform for effective products, education and sharing knowledge. What product ranges are available in your store? Our ranges come from around the world, at the moment we have 16 different ranges covering hair care, body care, household cleaners, baby products and face care, to name a few, we stock Trilogy (New Zealand), Green People (UK), Pai (UK), Pure Beginnings (South Africa), Weleda Baby (Germany), Pitta Patta (UK), Toms of Maine (USA) and new ranges are constantly being introduced, including make up and nail polishes. How did you decide on these products? Mostly from using them myself over the years and knowing that they are effective. All the products that I choose have to meet certain requirements in that they cannot contain undesirable synthetic chemicals and toxins, namely SLS, parabens, petrochemicals, phthalates and synthetic fragrances, mineral oil, formaldehyde, talc and a few other others. The products cannot be tested on animals and I choose brands that are environmentally conscious and certified by certain organisations such as the Soil Association and Ecocert. I like brands that are using technology to better the human race and not poison us just to make money. So the customer can trust the products we stock. What are the most important things that you think more people should know about regarding the content of the products that they use on their skin daily? 1) The cosmetic industry is not regulated with individual companies testing their own products and skewing their results to suit their needs. 89% of the 10,500 ingredients used in personal care products, have never even been evaluated for safety by the FDA. With your skin as your body's largest organ absorbing everything you put on it, over time the small amounts of toxins in each individual product add up to a huge amount going into your body. Scientific studies have found these synthetic chemicals/toxins in organ tissue which obviously then can lead to bigger problems (the problems they cause are highly debatable) - so its now up to the individual to decide for themselves if you want good ingredients or bad ingredients going into your body and what you believe the effects are - I think its obvious. 2) I have been shocked to find out how many brands are linked to animal testing, thinking that was a thing of the past and all companies had gotten better, I found most of the products I used were either performing animal tests or linked to companies that are - not good enough in my books. 3) Generally people who go through cancer or have very sensitive skin move to using natural, organic skin care products as they realise how harsh the products they use are. It should not take a life changing event to make you change something that is so easy to change and affordable at that - just pick a better brand off the shelf! 4) I wanted to make your readers aware that they must be careful in picking natural/organic products. Unfortunately due to the lack of regulation and current fad, I have seen many 'mainstream' brands labeling their products as 'paraben free', 'chemical free', 'sodium lauryl sulphate free' and then in fact they call these chemicals by other names in the ingredients list, or use other derivatives of these toxins or replace these toxins with other toxic chemicals. So its best to do research or talk to someone in the know. What is your own beauty secret to great looking skin? Love your skin, be gentle with yourself, drink water, always wear sunscreen and exfoliating and using masks at home is of huge benefit. How are the products that you sell priced relative to ranges such as Dermalogica, L'Oreal and Clinique? I sell products that vary greatly in price and are all relative to brands such as L'Oreal, Dermalogica and all the way up to Creme de la Mer and Eve Lom. People are often under the impression that because the products are organic, that like organic food they must be more expensive and that is definitely not the case. I know that you hosted a tea party last Saturday to raise funds for breast cancer, do you have any more events coming up? Not at the moment, however there has been interest in some champagne shopping evenings or mom's tea time during the day, giving people the chance to ask questions and here from myself and industry experts as to why you should be using natural skin care, so watch this space!